Lil' Blue Goat: Heirloom Seeds Now Available! "To plant a seed is to believe in tomorrow"
Some folks attribute this quote to Aubrey Hepburn. Others claim it is an ancient Greek proverb. Either way, we find it to be true. Planting seeds is an act of hope, faith, and confidence. Which is why we are SO EXCITED to announce that we have been approved to be dealers for Baker Creek Heirloom Seed Company's seeds this year! 6 of the 11 varieties we carefully selected to help assure success in our area! 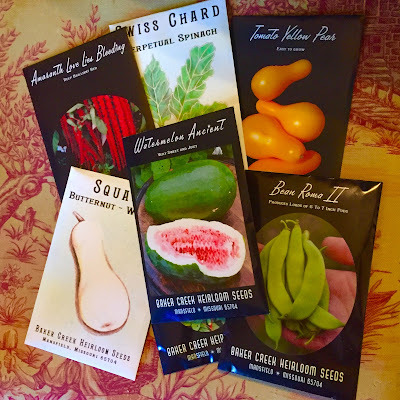 All seeds are priced exactly as Baker Creek prices them - but they come with local knowledge, my own 'plant binder and planting guide' that is available to browse through at the shop, and you don't have to pay for or wait for shipping! Not wanting to 'over-do it' in our first order, we CAREFULLY SELECTED 11 VARIETIES that we have personally experienced success with here in our part of North Texas. If you are looking to start a vegetable garden in the Mansfield area, these seeds are your best bet! - Beans - Roma II Bush Beans - flat Italian style green beans that produce prolifically. - Tatume Squash - a vining summer squash that tastes like a round zucchini and is more pest resistant than typical summer squashes. - Okra - hill country heirloom red - perfect for Texas! - Cucumber - Mexican Mini Gherkins - the size of a grape! We call them "Barbie Cukes"
- Chard - Perpetual Spinach variety - I planted some seeds in semi-shade back in 2015 and the plants just keep on producing chard leaves for me year round! - Pepper - Chinese Five Color - ornamental AND edible, without being 'too hot'. Potential energy is the defining force of our Seed-Selves. When our hearts are clear and connected, and when energy pours into us like a shower of light, we find ourselves refreshed, restored and recharged. 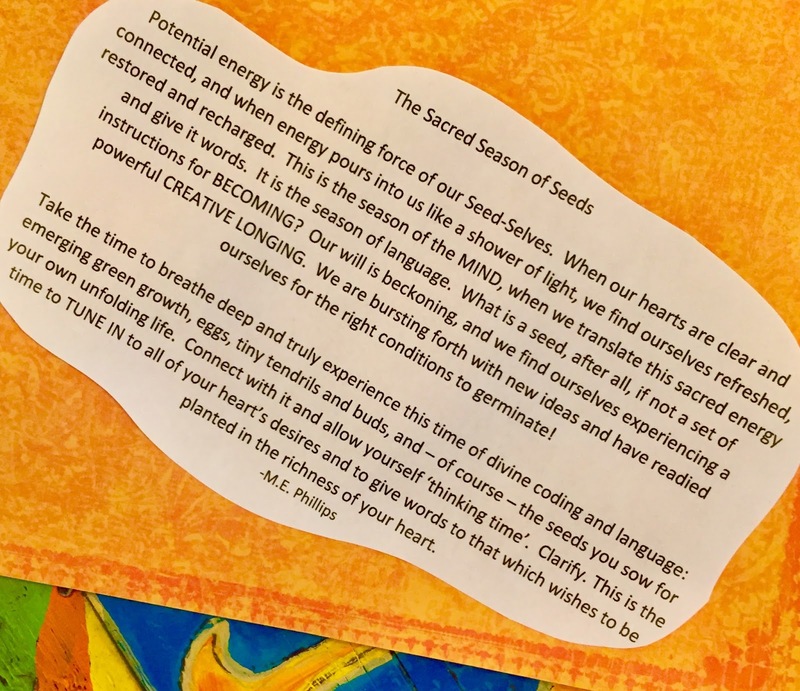 This is the season of the MIND, when we translate this sacred energy and give it words. It is the season of language. What is a seed, after all, if not a set of instructions for BECOMING? Our will is beckoning, and we find ourselves experiencing a powerful CREATIVE LONGING. We are bursting forth with new ideas and have readied ourselves for the right conditions to germinate! 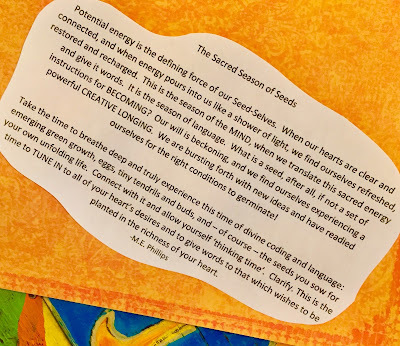 Take the time to breathe deep and truly experience this time of divine coding and language: emerging green growth, eggs, tiny tendrils and buds, and – of course – the seeds you sow for your own unfolding life. Connect with it and allow yourself ‘thinking time’. Clarify. This is the time to TUNE IN to all of your heart’s desires and to give words to that which wishes to be planted in the richness of your heart.